I have always loved fruit pizza. And nothing helps usher in the fall like apples. So apple pizza just makes sense, right? What if I told you that this apple pizza is baked on a brown butter cinnamon-sugar cookie crust? Are you convinced now? No? 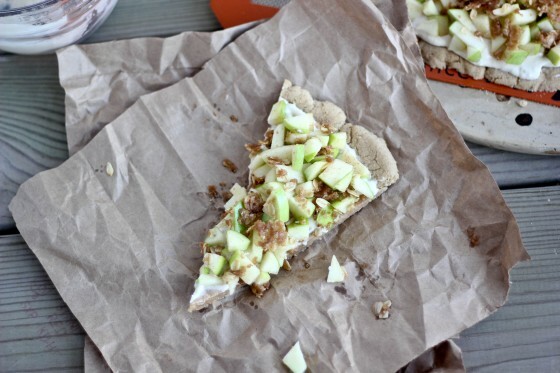 Well, then maybe the brown sugar Greek yogurt “sauce” will have you on board with this apple pizza, yes? I though so. I knew it wouldn’t take much more convincing than that. This apple pizza made my whole loft smell like fall. 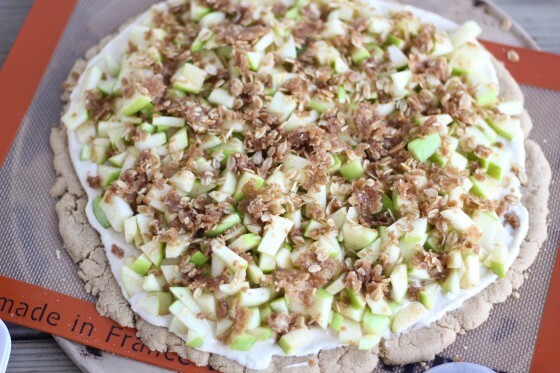 The cinnamon, sugar, nutty brown butter, and the apples meshed so well together on this fruit pizza. The crust is sweet and nutty and nearly melts in your mouth. And the streusel gives the perfect crunch along with the apples! 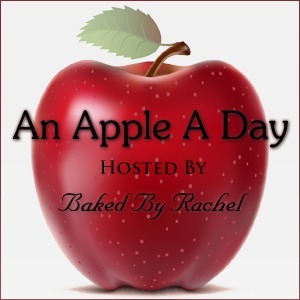 Rachel at Baked By Rachel is hosting an entire months worth of amazing apple recipes. Go check out the past posts and grab the recipe for my Cinnamon Streusel Apple Pizza at Rachel’s Apple a Day Party! Your post looks so tempting! I couldn’t get your link to work but I did get the apple to work. Once on her site though, I couldn’t find this recipe. Help please!!! I want to make this. Thanks! Oh my this looks delicious!! So wishing I had a slice of this for breakfast! Great job! Apple pizza, you’re a girl after my own heart! The perfect evening would involve making a savory pizza and then having your apple pizza for dessert. A double dose of pizza would send me to heaven! Alright, I’m ready for baking season and can’t wait to try some of the apple recipes you all come up with! yum! fruit pizza what a great idea! Very fun! This looks soooooo yummy! Swoon! Brown butter anything and I’m there!! How creative! What a delicious dessert pizza! I love it! Cass this would be my downfall!! This looks just amazing- and what a great treat for a football party! WHAT THE. I need that. I just love the creativity of this recipe Cassie! I seriously can’t wait to give it a try this fall. I love this, Perfect dessert for pizza night! Ummmm, yeah. In my mouth please. Sounds like a great new autumn dessert- the cinnamon sugar cookie crust might be my favorite part! Yum! This is a perfect fruit pizza, especially that brown butter cinnamon sugar cookie crust!! My sister makes a fab fruit pizza and I’m definitely passing this seasonal one on to her. Love it! This looks so good! I love fruit pizza and this is a great variation. brown butter cinn sugar cookie – right there, I HAVE To have this! Then add the streusel and it just got even better! That looks delicious! It is so funny how just the time of the year and the leaves changing colors makes me want apples, pumpkin and all those yummy fall spices. I love this, what a great idea! I want to add a drizzle of Nutella too :). This fruit pizza might be the best I have seen! What a great fall treat! Yum!!! What a great take on a fruit pizza. Dude, I’ve never had a dessert pizza before, and now I can’t stop thinking why that it! And I’m totally with Laura – I need that drizzle of Nutella too! Or maybe biscoff. YUM! Mmmmmm….I’m so happy apple season is upon us! Love your pizza, Cassie! Oh man, I LOVE dessert pizza and this looks fab! you are a true genius with this!! i love every pie inch of this. I love this recipe! This is so creative and the brown butter cinnamon sugar cookie crust is amazing! I adore dessert pizza! One of my favorites is chocolate chip pizza, but this is an 11/10 fo’ sure! Can’t wait to try. Can I pretty please have a slice or five? Please? Cinnamon sugar cookie crust. Just saying it makes me smile. Between your biscoff buckeyes and THIS pizza, I can only assume you have me in mind all week. just kidding! But Cassie, I love your recipes so much because they are exactly what my tastebuds scream for! a brown butter cinnamon sugar cookie crust is just out of this world! Takes dessert pizza to a whole other level. I love fruit pizzas, they are SO much fun and so versatile! WOW Cassie… this looks beyond amazing! This sounds fabulous – I love the sugar cookie crust!! Ohhh my..Im on my way over to get the recipe! Dessert pizza… you my friend are awesome! What a neat pizza idea! The boys will love it. Now that’s my kind of pizza! Delicious! I’ve been collecting apple recipes and this looks incredible! The kids would gobble this up, I must make it for them! Cassie this pizza is spectacular. Way to kick off fall with a bang. Love it! A perfect treat for my daughter’s sleepover. Pingback: Apple Pie Danish - Chocolate Chocolate and More!